As the fleet returned to yesterday's start area around Peel Bank, conditions were sunny and relatively benign, but with giant grey clouds looming. 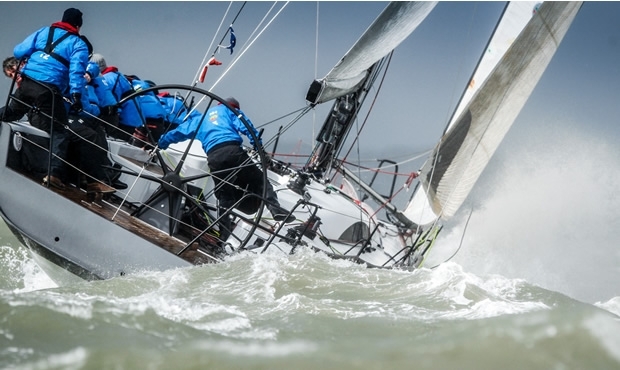 During today's one race, a squall stuck down the fleet with gale force gusts of up to 40 knots. In addition to numerous broaches plus a overboard incident on RORC Admiral Andrew McIrvine's First 40, La Réponse. Fortunately the MOB's lifejacket inflated and they were recovered after a few minutes and hauled onto a RIB by RORC Commodore Michael Boyd and lead coach, Jim Saltonstall. The incident cost La Réponse victory in IRC Two, where today's race was claimed by former RORC Commodore Mike Greville on his Ker 39 Erivale III and the class prize went to Ireland's Conor Phelan and his Ker 37 Jump Juice. Today's FAST 40+ race was won by Anthony O'Leary's Ker 40 Antix. For the Irish two time Brewin Dolphin Commodores' Cup winner, this event was their first sailing this season. However O'Leary acknowledged that Antix prefers the big conditions. "Pound of pound, we sail better in a gale than in a calm." However, in similar conditions, they had finished fourth in yesterday's race. "We made some silly mistakes and you deserve to get punished for that. Our mark rounding was getting better as the weekend went on."